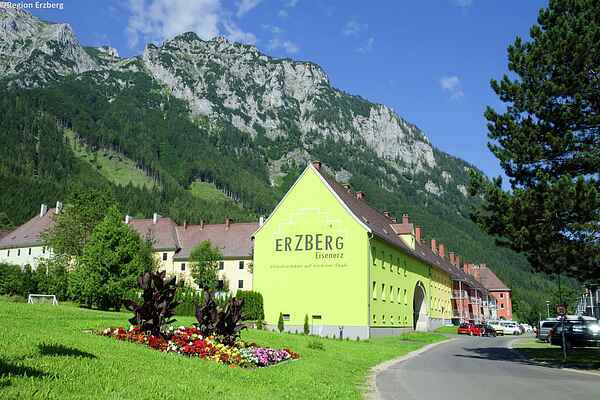 The old town of Eisenerz is located amidst the striking mountain landscape of the Eisenerzer Alps. Mainly known as a mining centre in the past, nowadays it is a popular tourist destination where many original features have been preserved. Where the miners once lived you will now find a high-quality modern resort with charming apartments. Your apartment has 2 bedrooms, a great living room and a separate modern kitchen with a dining nook. The balcony is a wonderful spot to enjoy the surroundings. The resort has plenty of parking and nice playground equipment for the kids. As a service, for a charge, you can order fresh bread rolls or make use of the sport hall. In the immediate vicinity you will find beautiful lakes, a lovely swimming pool, vast hiking areas and impressive mountain scenery. In winter the fun Präbichl ski area (11.5 km) is just a few minutes away, and there are plenty of options for cross-country skiing as well.